Reredos carved 1930 in memory of Miss Whitington, All Saint’s Church, South Hobart . Who was Nellie Payne? 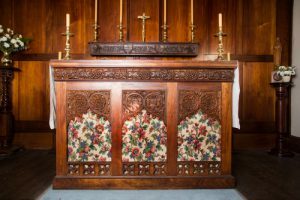 Reredos, All Saints Church, South Hobart. All Saints Church, South Hobart. ……. ALL SAINTS’ CHURCH PATRONAL FESTIVAL. The services of the 72nd patronal festival of All Saints’ Church began with a Sung Eucharist at 7am on Saturday (All Saints’ Day), when there was a good attendance, both of choir and congregation, the service being Merbecke. The rector (Rev. T. K. Pitt, M.A. ), at the request of the Vicar-General, dedicated an extremely handsome blackwood reredos, carved by Mrs. Payne, in the Chapel of St. Mary and St. George. The reredos, which occupies the whole of the wall underneath the fresco of the Nativity, is given in memory of Mrs. Whitington, and is not only a thing of great beauty in itself, but brings out the beauties of the fresco, to which it is a most appropriate setting. 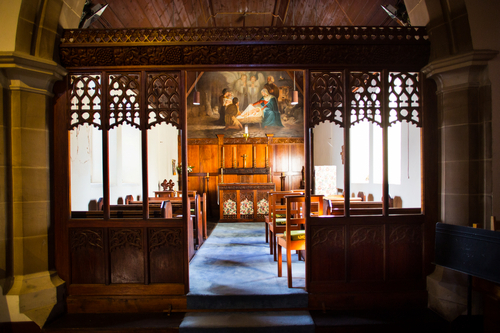 The whole is completed by a fine Axminster carpet, which gives an increased appearance of size to the chapel. Both reredos and carpet were given by friends of the late Mrs.Whitington. One would go far before seeing a more beautiful and devotional chapel, than this in All Saints……….